We’re back with another round up of the latest coin collecting news and articles from around the internet! Coin Update News provides coverage of the sale of a trio of rarities at the Heritage FUN convention auction. The finest certified 1787 Brasher Doubloon sold for 4,582,500, the Hawaii Five-O 1913 Liberty Nickel realized $3,290,000, and an example of the 1927-D Double Eagle graded NGC MS 66 realized $1,997,500. At $55 million and counting, the Heritage auction is on track to be the highest grossing of all time. Dave Harper calculates the compound rate of return for the 1787 Brasher Doubloon and the 1913 Liberty Nickel. An article on Bloomberg covers some of the world coin from the Heritage auction held for the New York International Numismatic Convention. A rare 1905 cast bronze Theodore Roosevelt Inaugural Medal designed by Augustus Saint Gaudens and Adolph A. Weinman is included in the highlights of the upcoming Stack’s Bowers February 2014 Americana Sale. Here is some advice on how to avoid becoming the victim of a fake gold coin. NGC has announced the 2013 NGC Registry Award winners. PCGS and Dupont Authentication have announced the creation of a new, anti-counterfeiting 3D security hologram for PCGS holders. The Perth Mint has announced the Australian Kangaroo 2014 1oz Gold Bullion Tribute Coin featuring the iconic Red Kangaroo design by Dr Stuart Devlin AO CMG. The first 2014 commemorative coins are now available from the Royal British Mint. 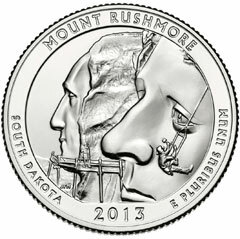 Circulating coin production at the United States Mint reached nearly 12 billion pieces during 2013. Compared to the prior year, large percentage gains were seen for the quarter and half dollar denominations. And now for some notable auctions. First, the 2008-W Uncirculated $50 Gold Buffalo graded PCGS MS70. This coin had a final mintage of 9,074 pieces, the lowest of any coin for the series. Next, a lot of 12 proof modern commemorative silver dollars graded NGC PF 69 Ultra Cameo including a nice assortment of designs from 1992 to 2007. That’s it for the update. Have a great weekend!